Sorry for the quality of the video. 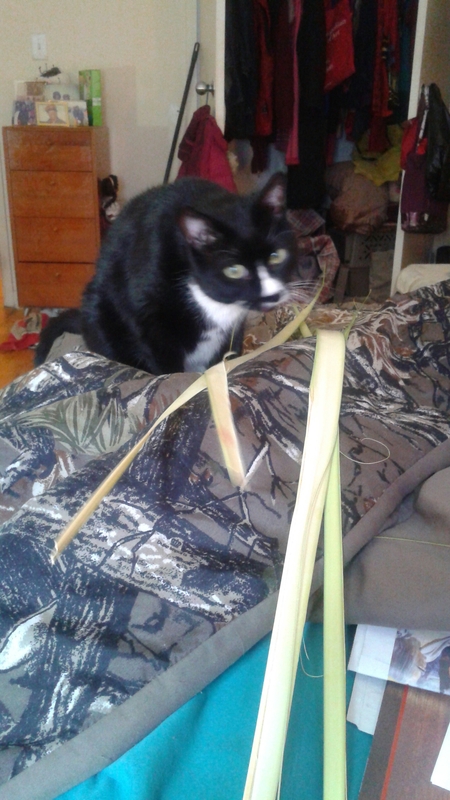 Some parts of the house are dark but you can hear Sylvester’s Meow’s of Joy as we play Chase the Palms!! Happy Palm Sunday to you both. Sylvester reminds me so much of our Dutch whom we lost a few years ago. Thanks for sharing. Thanks! Sylvester is one crazy cat. My condolences for Dutch. I lost my other Tuxedo cat Weezer December 2015. It is difficult when pets cross the Rainbow Bridge. Yes I understand. Years ago when I was a child my beagle Dolly had to be put down. I was very upset. That dog meant the world to me. At least now I know that Dolly along with all my other pets are in Heaven. I believe Jesus Loves pets and all animals. I will see my furry friends again one day. LOL! Trust me he would give Gaia indigestion for sure. I hate bullies of any kind!